From Quad Bikes to Supercars - there is a Driving Experience for everyone. Make a loved ones day with a blast in an Aston Martin or Lamborghini or get them up to speed in a Ferrari. Plus save up to 60% on your purchase and don't forget to check for a voucher code for extra instant savings. 2 hours, 4 minutes left! Where do I use my Virgin Experience Days voucher code? Select the code of your choice, copy it then click through to the Virgin Experience Days' site. When you’ve found the perfect experience, add it to your basket. When finished, click 'My Basket' in the top right corner. Choose whether to add a gift message, any packaging and choose a delivery option. Scroll down and look for the section which is titled ‘Have a discount code?’ insert your code into the box and click 'Apply’. Your order total will be updated with your discount, click 'Checkout' to continue with the transaction and complete your order. Up to 87% off can be found in the special offers section then use the price range filter to narrow your search and find the best prices. Experience Days can be for a number people with some designed specifically for “couples”, such as romantic dining for two or mother and daughter pamper days. You could be part of the Formula team at Silverstone, be a part of the audience at a West End show before dining out in style, leap from a plane and skydive to the ground, climb a mountain or relax on your own tropical hideaway, all courtesy of Richard Branson’s team who provide you with the means to book your perfect day, then once you’ve paid you can enjoy that once in a lifetime treat. So whether it’s been a lifetime's ambition or a desire to try something new take a look at what’s on offer. Virgin Experience Days was founded in March 2001 by the Virgin Group. It was started by Richard Branson, who is both the founder and chairman of the Virgin Group. The original aim of the company was to provide corporations with incentives for staff and customers through a variety of exciting experiences. It quickly expanded, however, to the consumer gift market where it flourished. In the summer of 2003 Virgin Experience Days joined up with Acorne Sports with which they’d had an affiliation since 1995. Acome was the original experience business. Through their experience and contacts, Virgin Experience Days was able to share the knowledge and good relationships Acorne Sports had already been able to establish. Today, Virgin Experience Days offer a large variety of experiences to cater to all tastes. They’re continuously expanding their database, providing ever more amazing adventures to choose from. Virgin Experience Days offer a wide selection of inspirational gift ideas. These range from hotel breaks, theater trips, and famous venues, to adrenaline-pumping experiences such as supercar experience days, the perfect experience days for men. Other experience days for men include Rally driving and other driving experience days that are sure to get not just the cars racing but your hearts racing too as you step into your dream car and go for a spin, formula 1 style, on some of the best tracks in the UK including the circuits at Silverstone and Brands Hatch. There are also flying experience days available, where you get the opportunity to get behind the controls of a variety of small aircraft's the perfect induction to a new hobby that will awaken every sense and blow your mind away. Flying experience days are the perfect chance to fulfill a lifelong ambition and childhood dream for you or for someone special. If you aren’t daring enough for one of those experiences then there are other options you can choose from as well. At Virgin Experience days, it’s all about choice and exciting experiences for all manner of people. Men who enjoy sports will appreciate the golf experience days where you can take part in golf lessons from PGA Professionals then practice your new found skills with a round of golf. Experience days for men are created to give yourself or someone special a day they’ll never forget with an experience of a lifetime. Experience days for women can range from anything from afternoon tea to skydiving experiences to luxury spa days. Buy a spa day voucher for yourself or a lady special to you and save money on incredibly relaxing spa days in locations all across the UK. Indulge in a city spa escape for two at a Bannatyne Spa, a soothing day for two at Greenwoods Spa or a Marriott Pamper Treat where you’ll leave feeling replenished and rejuvenated after gentle treatments in a serene, peaceful setting. Choose a spa day voucher on whichever spa package you’d prefer whether it includes tea for two, a light and tasty lunch or a champagne reception, each will make you feel privileged and pampered. Your treatments can include anything from manicures to Swedish massages to facials and you’ll also have access to the pool, sauna and steam rooms available depending on which spa day experience you wish to choose. Spa day vouchers are the perfect gift for your mum or any other female family member or friend who deserves some well-earned chill time. Or you can always treat yourself to a spa day voucher and enjoy a peaceful day at a good quality spa. Gift experiences for couples are the ideal gesture. A gift experience to a famous landmark or city escape is sure to please both partners who get to enjoy a romantic escape with their loved one. Not only is it a thoughtful gift it's also the perfect chance to give a couple some lasting memories that they can share forever. Choose a gift experience that a couple or you and your loved one will cherish forever, like the Shard experience. This allows you to appreciate the view from the Shard with a three-course meal at Marco Pierre White’s London Steakhouse Co. Sit together and admire the astonishing views of London while you enjoy a cocktail or two that are included in the package. Afterwards, take to the busy London city for a romantic stroll down the River Thames and enjoy the buzzing evening atmosphere and excitement London brings. How long will my experience voucher be valid for? This depends on the type of voucher you choose. The validity will vary between 3 and 12 months and will be clearly stated on the voucher. There is an option to extend the expiry date once the voucher is expired, this will involve an administration charge of £20. Am I able to buy a voucher as a gift? Yes. There are no names printed on the voucher, up until the experinece is booked the voucher is able to be used by anyone. How do I book my chosen experience? Once you receive your voucher you will need to activate it here. You will then receive an email which will contain a section 'How do I make my booking?' If you follow the instructions within this section you can book your experience for your desired loaction and date (subject to availability). 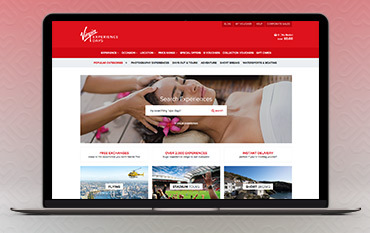 Virgin Experience Days is a UK online gift experience retailer with experiences available across a number of categories including pampering, flying, driving and gourmet cooking lessons there is something for everyone. Having you ever dreamt of being a Formula One driver? Or flying an aeroplane? Maybe you just want a nice relaxing pamper day and haven’t been able to find the time or it may be that you don’t know where to start looking. Well you need look no further than Virgin Experience Days. Grab one of our Virgin Experience Days Discount Codes for great discounts and the hottest deals. With a wide range of activities to choose from, whether you’re looking for a gift to give someone, or if you’re looking to treat yourself you’re bound to find something to arouse your interest.